Access your most relevant data in seconds using the new Power BI app for Apple Watch. 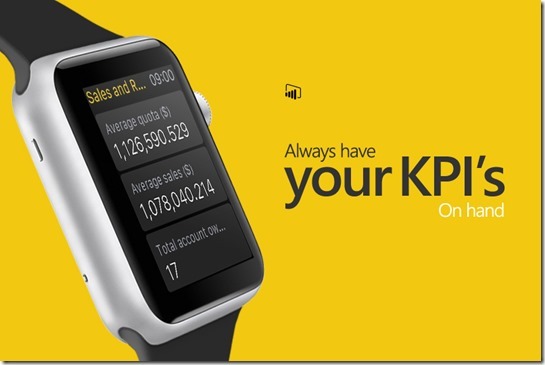 The Power BI app for Apple Watch supports both KPI and card tiles. These types of tiles are ideal for a small screen and provide you with a heartbeat measure of your business. The Power BI app for Apple Watch also supports displaying a tile directly on the watch face so it is visible and accessible at all times. This display will stay up to date, and will update shortly after your Power BI datasets are scheduled to update. You'll always have the latest information at your fingertips! Please update your Power BI mobile app to get these latest changes, other improvements and bug fixes. Your feedback will help us decide what to implement in the future, so please don’t forget to vote for other features that you would like to see in Power BI mobile apps.